A confession to begin: David Mitchell is one of my favourite living authors. I have loved each of his novels to date, and think he is one of the most talented & interesting authors writing in the English language so far this century. So I approached his latest, The Thousand Autumns of Jacob de Zoet, with a fair degree of anticipation, and am perhaps not the most objective reviewer of this book. Mitchell's first three novels - Ghostwritten, Number 9 Dream & Cloud Atlas - were highly formal works, with complex uses of form. Cloud Atlas really reached the zenith of that style, in a way - told in six voices, with each section reflecting back on the one before it, so that the diary which formed the first part was read by a character narrating the second, and so on. And then halfway through, the book reversed upon itself, working backwards in time through the six sections again. Each of the sections stood up on its own, but the combination of them all was a thrillingly eye-opening experience. Anyway, this review is not about Cloud Atlas. The book that followed it, and preceeded this one, Black Swan Green, was still episodic in nature but also signalled a more personal approach for Mitchell. And with Thousand Autumns..., formal experimentation takes a definite backseat to character. Set in Japan at the end of the 18th and start of the 19th century, Thousand Autumns... explores the relatively unknown world of the first Europeans to have significant contact with the Japanese. At a time when Japan was incredibly isolated from the rest of the world, the limits of their outside contact was via a small island, Dejima, off the coast at Nagasaki. The Dutch traders are allowed only on the island, not onto the mainland itself, and much of Thousand Autumns... is about the somewhat-strained relations between the two cultures. Our protagonist is Jacob de Zoet, a promising young clerk sent to Dejima to investigate allegations of corruption amongst the senior Dutch merchants. This, of course, does not make him popular with his countrymen, but he remains dedicated to the task while also forming links with Japanese translators and officials. In the novel's second section, the scope widens and Jacob receeds into the background as other characters' stories are told, but then the focus returns to Jacob in the final sections, while retaining other perspectives (& introducing new ones - Mitchell hasn't completely abandoned the multiple-narrator style that characterised Ghostwritten and Cloud Atlas). The second and subsequent sections explore a mysterious convent in the country and its relationship with what goes on in the trading town. As seems to be a theme of this year's Booker longlist, narration is omniscient third-person, and different sections/chapters are told from the perspective of different characters. 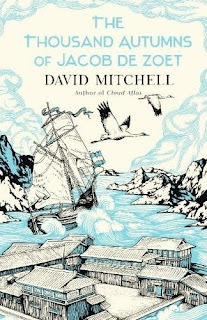 The Thousand Autumns of Jacob de Zoet has an intricate plot, and I don't really want to say too much more about that. I will say, however, that even given my high expectations and hopes, I loved this novel. It may not have the breath-taking pyrotechnics of Cloud Atlas, but in it's own quieter way, it's just as impressive a novel. Mitchell has now been long- or short-listed for each of his novels. I fully expect Thousand Autumns... to make the shortlist, and am hoping that this can be the one for which he finally wins. Next: Tom McCarthy's C, which I started reading this morning.